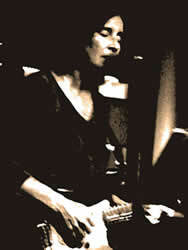 Beth Fitchet Wood is a singer, guitarist, composer, producer and teacher. Also, check the Honk page. Left Right Here - 2016 - 12 new songs from Beth. She swore she would never make another CD until her family convinced her otherwise. Steve Wood on keyboard, harmonica, clavietta, voice, etc. and Nate Wood on drums, most bass and lots of electric guitar. The only other musician is Paul Cartwright who played a heartbreaking solo on #4. With Jan Olsson's original painting on the front, and her cover design. Lyrics included. Red Red Sky - 2010 - Beth does 12 of her originals. Begun as a simple live voice/guitar project, it grew from there. Steve Wood on keyboard, harmonica, clavietta, voice, etc. and Nate Wood on drums, most bass and bebot. Richard Stekol on banjo and mandolin, with The Girls (Sue Bredice and Carolyn Miller) on background vocals. 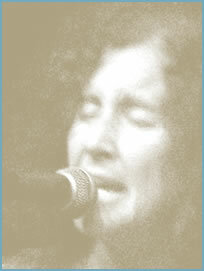 This album includes the songs which won Beth the guitar at the Tucson Folk Festival. Another beautiful cover by Jan Olsson. Silos - 2000 - Produced by Steve and Beth Wood, and Daniel May. Eight original songs by Beth, with performances by Dave Moody, Penny Watson, Sam Most, Daniel May, Steve Crum, Steve Wood, and the Great Nate Wood. This is a jazzier side of Beth. Autumn To May - 2002 - Two childrens' albums in one. Includes most of the cassette "Autumn To May", produced in 1984 by Will Brady and Beth F. Wood, and features chickens and thunderstorms, among other things. Also includes cuts from "The Top" produced in 1989 by Beth and Steve Wood. Many previously unreleased songs by Jackson Browne, John Hiatt, Doug Haywood, and Beth and Steve. Sacred Cow - 1996 - by Zero Ted. Three singer-songwriters, Steve Wood, Beth Fitchet Wood and Daniel May each do 4 songs. This bandname, which originated in South Dakota has gone through many incarnations. Rumor has it that "Zero Ted" was the name of the Zeroth cat of someone's girlfriend. Jazz and pop and some stunning playing. That's What Dreams Are For - 1989 - by The Girls. Three seems to be a magic number. Sue Bredice, Beth F. Wood and Carolyn Miller share this album, with beautiful harmonies, some original material by them, and by Richard Stekol and Steve Wood of "Honk", with drums by Tris Imboden, and even a cameo appearance by Michael McDonald. Produced by Steve Wood.